Keeping plants healthy is an important aspect of landscape maintenance. To make this possible, surface water control is necessary. Unfortunately, many Vermont home owners tend to overlook this very important system. Ignore this and you’ll eventually find your flowers, shrubs, and trees dying because of excessive water. Soon, it will be dead. What is Surface Water Control? Surface water control is an important aspect of irrigation. Irrigation system is anything that is used to supply plants with enough water. Watering cans and buckets are common ways of doing it. But today, there are more sophisticated methods to do this, which will be discussed in the next section. 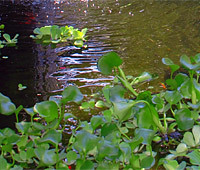 Just like the irrigation systems, there are many techniques on how to control surface water. Building downspouts and gutters are quite popular ways. But these must be combined with surface grading around your home. The problem will never be solved without adding into the equation the type of soil that the landscape has, Vermont’s weather patterns, and the home’s foundation. Rainbow Acres Landscaping is not only trained and knowledgeable at building the perfect surface water control system for your garden. We are also broadly experienced at doing this and more of the necessary tasks for completing an almost maintenance-free landscape. Please check our portfolio and there, you will see some of our past projects in Northfield, Jericho, South Burlington, and many other Vermont cities. Surface water is the water left on the soil surface after water is introduced on the plants. The water may have come from the rain or the regular watering of plants. Although helpful for some plants that love damp soil, most Vermont plants will die when left with surface water. Controlling the surface water is necessary at this point. Every soil type and every plant species require different kinds of irrigation systems. One system may work for your neighbor but that same system may be the worst for your garden. 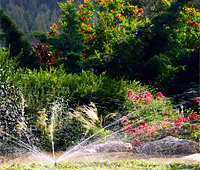 It is best to hire professionals when deciding about your landscape’s irrigation system. They have all the tools, training, experience, and skills needed to build the best system based on the soil type and plants. The best system may be the surface irrigation, drip, sprinkler, or sub irrigation. Surface irrigation works by supplying the water through moving across and over the land surface through gravity flow. Drip irrigation continuously releases water drop per drop into the roots. In sprinkler irrigation, water is gunned up to the air so it will be released down to the soil. Lastly, sub-irrigation is supplying of water right to the roots. In this system, pipes are installed underground, near the roots so that water is delivered where it is supposed to. Sometimes, two or more irrigation systems may be combined especially if one area needs one system and the other needs a different one. Both small and large landscapes need the perfect irrigation system and surface water control. Luckily, Rainbow Acres Landscaping can work on any scale of project. This is a critical addition to any landscape. You better act on the landscape’s irrigation system as soon as possible before it’s too late. Contact us today and we’ll immediately plan and devise an effective surface water control system for your landscape.